LONG BEACH, Calif. — NASA's 23-year-old Hubble Space Telescope is still going strong, and agency officials said Tuesday (Jan. 8) they plan to operate it until its instruments finally give out, potentially for another six years at least. After its final overhaul in 2009, the Hubble telescope was expected to last until at least 2015. Now, NASA officials say they are committed to keeping the iconic space observatory going as long as possible. "Hubble will continue to operate as long as its systems are running well," Paul Hertz, director of the Astrophysics Division in NASA's Science Mission Directorate, said here at the 221st meeting of the American Astronomical Society. Hubble, like other long-running NASA missions such as the Spitzer Space Telescope, will be reviewed every two years to ensure that the mission is continuing to provide science worth the cost of operating it, Hertz added. In fact, Hubble supporters hope it will continue to run even after its successor, the James Webb Space Telescope (JWST), is launched — an event planned for 2018. What appears to be a number of astronauts, because of the shiny mirror-like surface of the temporarily-captured Hubble Space Telescope, is actually only two - astronauts John Grunsfeld (left) and Andew Feustel during a May 14, 2009 spacewalk, the first of five during their STS-125 mission. 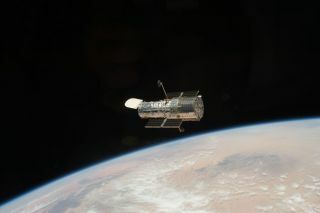 The Hubble Space Telescope was launched in April 1990, and has since been upgraded five times by astronauts in orbit. Its last space shuttle servicing mission in May 2009 left the scope with two new instruments, including a wide-field camera and a high-precision spectrograph to spread out light into its constituent wavelengths. The space telescope is named after the late astronomer Edwin Hubble (1889-1953), who proved that the universe is expanding. "It's working better than ever, 23 years in," Dan Coe, an astronomer working with Hubble at the Space Telescope Science Institute in Baltimore, Md., told SPACE.com. "We're still pushing the frontier." Coe agreed that overlap time with both Hubble and James Webb operating simultaneously would be ideal. Such a plan would allow the observatories to work on complementary projects and provide crosschecks between the two telescopes' measurements. How long Hubble can run also depends on NASA's budget, which, like funding for all federal agencies, is uncertain given the economic challenges in the United States. "It all comes down to money," Coe said. Funding the development of the James Webb Space Telescope is currently taking up almost half of NASA's total budget of $1.3 billion for astrophysics in 2013, Hertz said. The observatory has an estimated price tag of $8.7 billion, and will cost about $628 million in 2013 alone. In contrast, Hubble will cost about $98 million in 2013.